Today Dancing Dragon Games, creators of Skyborn and Deadly Sin 1 & 2, and Degica announced Echoes of Aetheria (http://store.steampowered.com/app/354740/) is coming to Steam on January 15, 2016. 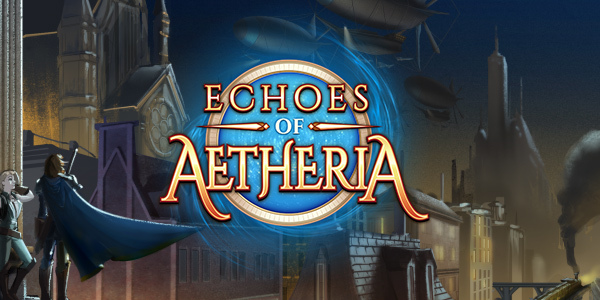 Echoes of Aetheria is a unique saga that begins with a humble wedding gone-wrong and twists and turns that story until you’ll find yourself at the helm of a global scale conflict. Rise up from your beginnings to lead a newly formed nation to glory, but beware those who plot against you at every turn! Treason, defection, rebellion, and even the creation of a new nation are all parts in which you’ll have a role to play. As you progress further, the scope of the story will grow with your heroes. By the end, you’ll have to weigh your decisions and their consequences against the fate of entire nations. Echoes of Aetheria features a new 15 tile grid battle system that allows for complex tactical decisions. Your home base will play a major role in both the story and the equipment of your heroes. Here you will have a chance to discover all the qualities and flaws of your companions and NPCs, as well as access a full crafting system capable of producing thousands of unique items. When you have some down time, you can also participate in battle events that will unlock new gear and give you valuable experience for the coming trials.